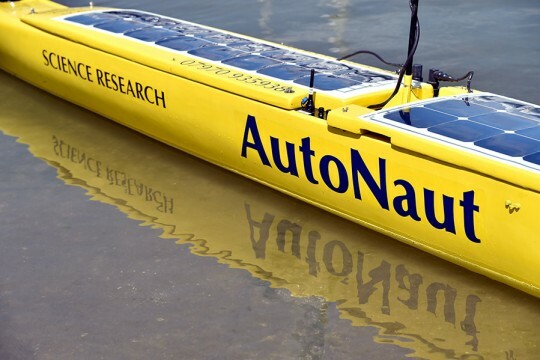 AutoNaut ® is a wave propelled Unmanned Surface Vessel (USV) creating a step forward in autonomous data gathering. Wave propelled means no fuel to cross the world's oceans. USV means controlled by satellite from anywhere on the planet. AutoNaut is the answer to the age-old challenge of affordable oceanic data gathering and creates new opportunities to meet unique mission requirements in a changing world. There are four AutoNaut sizes, ranging from 2 to 7 metres. With increased length comes greater speed and payload capacity, as well as an increase in the power generation capability for the on board sensors. Auxiliary electric propulsion or hybrid drive is available for calm conditions and manoeuvring. A fuel cell may be fitted to provide additional power for sensors, although for most missions the Photo Voltaic panels harvesting solar energy on the deck will be sufficient.